Bolting material for cast-iron flanges is listed in ASME B16.1. Generally, ASTM A307, grade B material is suitable. For steel flanges, acceptable bolting material is listed in ASME B16.5. Threading: Bolts and nuts normally are threaded in accordance with ASME B1.1 Standard for Unified Screw Threads. In diameters 1 in and smaller, Class 2A fits on the bolt or stud and Class 2B on the nut applies with the coarse thread series. In diameters 1¹⁄₈ in and larger, the eight-pitch-thread series applies with the same fit. Grade 7 bolts are threaded by roll threading after heat treatment. Roll threading cold-works the surface uniformly. where D is the nominal bolt diameter and N represents the threads per inch. 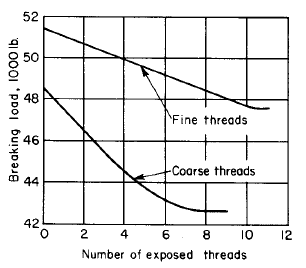 Bolts with fine threads will exhibit a slightly higher proof strength (about 10 percent) than bolts with coarse threads (as illustrated in below given graph), provided that the length of engagement with the mating internal thread is sufficient to guarantee a tensile failure through the bolt rather than failure by thread stripping. In practical bolt assemblies, fine threads are considered weaker because of reduced thread height. Fine threads have limited application for threaded assemblies. They should be used for adjustment rather than as a clamping force. The dimensions applicable to bolting materials are given in ASME B16.5, American Standard Pipe Flanges and Flanged Fittings. Securing and Tightening. For the average low- and medium-pressure installations, bolts are made in staggered sequence with wrenches which will usually result in adequately tight joints. For the high-pressure and -temperature joints, it becomes increasingly important to make up each stud to a definite tension. Torque wrenches are sometimes used for this purpose. In exceptional cases where a more positive method is desired, the studs may be tightened until a definite elongation has been attained. For this condition, an initial cold tension of 30,000 psi (2100 kg/cm2) to 35,000 psi (2460 kg/cm2) in each stud is recommended. Since the modulus of elasticity of stud material is about 30 106 psi (2.1 x 106 kg/cm2), a tension of 30,000 psi (2100 kg/cm2) would result in an elongation 0.1% of effective length. The effective length is the distance between nut faces plus one nut thickness. Special studs with ground ends are required to make micrometer measurements for this purpose. 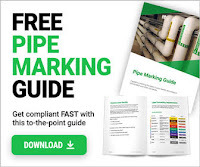 After the joint has been in service, periodic checks of the actual cold lengths as compared with the tabulated lengths will detect any permanent elongation of the studs. Permanent elongation will indicate over-stressing, relaxation, and creep. When these conditions become severe, new studs may be required to maintain the joint properly. Special thread lubricants are available for temperatures both below 500 F (260 C) and from 500 F (260 C) to 1000 F (540 C). Such lubricants not only facilitate initial tightening but also permit easier dis-assembly after service. 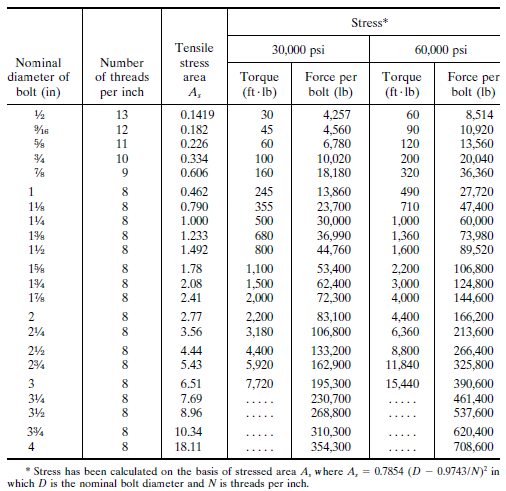 Above given table illustrates the turning effort required for tightening well-lubricated threads and bearing surfaces. Tests with no lubricant on threads and bearing surfaces may increase torque requirements by 75 to 100 percent to secure a given bolt stress.